Characters perform best with the best mods assigned to them. Every character is different, however, and requires different sets and stats. Be sure to review the individual character mod guides for specific details on what mods work best for which characters. Characters that inflict debuffs, such as Stun, Buff Immunity, Ability Block, etc. With 12 possible secondary stats available, a single mod could end up with any of the individual stats and with those stats within any range. In the Primary and Secondary Stats section, estimated secondary stat maximums are listed. The most important secondary stat is Speed! All other secondaries pale in importance when compared with Speed. 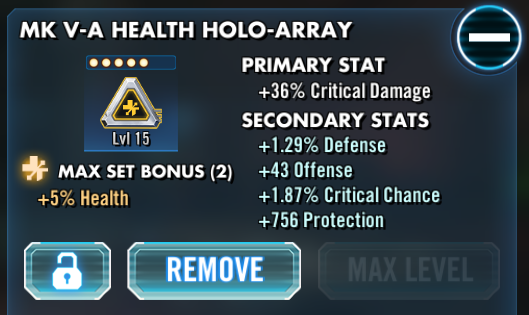 Overall success in Star Wars Galaxy of Heroes comes from an ability to differentiate a “good” mod from a “bad” mod based on its primary and secondary stats. The Offense, Health, and Potency secondaries are all very mediocre, but +13 Speed is an excellent secondary stat, which makes this a good mod. With the added Potency, this mod would work best on a character that applies debuffs and generally has lower Critical Chance. Note: The mod set is Offense, which means that three additional Offense set mods are required to create the set bonus. Even though this triangle has a Crit Damage primary, with decent Offense and some fairly useful Protection, this triangle does not have a Speed secondary. Since triangle mods are rare and it does have the Crit Damage primary, it’s not entirely useless, but it’s value is severely decreased since it does not have Speed. This mod has +8 Speed secondary which would be decent on any other shape, but this is an arrow. A Defense primary on an arrow is a horrible stat, especially on a Crit Damage mod set. Furthermore, this mod is levelled up to Level 12 meaning that +8 Speed is the highest we’ll see for the Speed secondary, even if it is levelled to Level 15. While the mod has some value with the +8 Speed, it’s value is severely diminished with the Defense primary on an arrow, instead of Speed. 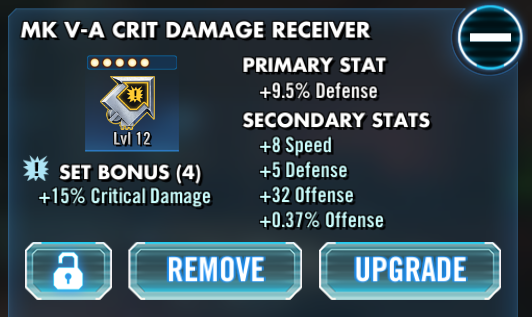 The Crit Damage set also belongs on a character that requires more speed than defense, making the mod of even more reduced value. While the Health % and Offense % give very mediocre increases, the mod still has a bit of value. The +1393 Protection adds a nice amount to the base Protection and +5 Speed is still better than a mod with no Speed secondary at all. Also, the mod is Tier D (Green) and can be sliced to higher Tiers, up to 6E. Which is better? Neither. Both mods have extremely limited use and are equally terrible. The 1D mod at Level 15 has only +1 Speed and its primary and other secondaries are so low that it is hardly worth assigning at all. On the other side, the 4E mod has to be fully upgraded to see any of its secondaries. 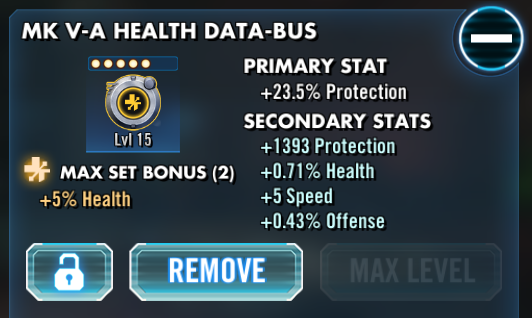 This mod could end up with a Speed secondary, but because Speed is not currently showing, the max Speed secondary is +5. Research into mods has shown that there is less than 6% chance for a grey mod to end up with a Speed secondary. Additionally, a 4E mod will always remain a 4E tier mod. There is no current method to increase a 4* mod into a 5* mod and there is no way to slice an 4E mod into a higher Tier (4D, 4C, etc.) either. Understanding the value of mods by reviewing the available stats is the key to ensuring that a player’s characters are modded best. As discussed in the Mod Sets section, creating valuable sets is almost as important as finding the right secondaries. Three pairs of Health mods can provide ~30% bonus in health (10%+10%+10%), but even +30% off a character’s base Health is not that much in comparison to all the increases available. Rather than three sets of Health mods, it would be better to include one set of Health mods, one set of Potency mods, and one set of Tenacity mods. Instead of a 30% increase in just Health, the exchange would be +15% Potency and +20% Tenacity, which creates a more well-rounded character. Four Crit Damage mods provide +30% Crit Damage, and an added a pair of Crit Chance mods gives +8% extra Crit Chance, which generally aids the frequency that +30% Crit Damage is applied. Sometimes one mod set may be more plentiful than another. It is often better to apply even a pair of Health mods with four Crit Damage or Speed mods than use just one set. That said, in some cases, having entirely mismatched mods can be useful when all the mods have very high Speed secondaries.